Spring break is right around the corner, and summer will be here before you know it. Will you be traveling anywhere special? If so, you will definitely want to start looking into ways to save on gas. 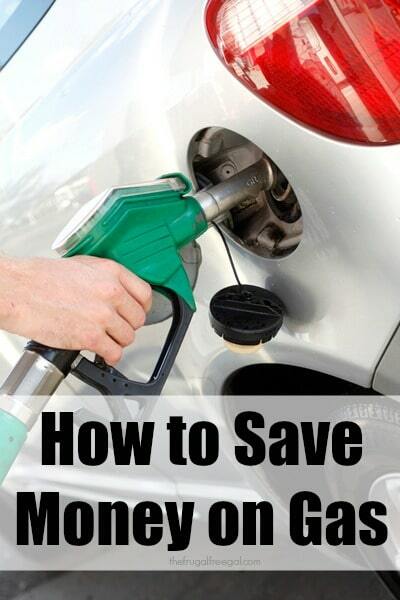 Thankfully, your search will be a short one because I compiled ten great ways to save on gas all right here! Use one or use them all–your wallet will thank you. It can be easy to find yourself making several trips all over town to pick up everything you need. Save yourself time and money by keeping a running list and then simply making one big trip or picking up items while you are out anyway. In my town, there are certain gas stations that are routinely less expensive than others or that always wait longer to raise their prices. I’m guessing the same thing happens where you live. Find out which stations do this and make those the ones you visit regularly. If you aren’t sure which stations have the best prices, there are apps that can help you. Every time you brake, you waste the momentum your car already has and force it to use more gas to accelerate again. While you will definitely want to brake when needed to avoid a crash, giving the car in front of you plenty of room can help reduce the number of times you have to brake. Underinflated tires can really reduce your car’s fuel efficiency. Check your car’s tire pressure regularly, especially before you head out on long trip. Does your local grocery or convenience story offer a gas rewards card? If so, use it! You might as well save a little extra money by buying all of the items you use and love anyway. Getting in a toasty warm car in the morning may be nice, but warm your car for too long and all you’ll do is burn through your fuel. Warming your car for a minute or two is fine, but don’t leave it running for an extended period of time while you get ready. Do your friends, family members or co-workers live nearby? Instead of all driving separately to each event, consider going together. Not only can this be a lot of fun, but it can save you big in fuel costs as well. If you will be spending several days away from home, if you’re traveling a long distance or if you’re traveling with children, it can be tempting to pack everything you own. Resist the urge. The heavier your car is, the more drag it will create and the more fuel it will take to keep it running. Gas prices often spike right before holidays. Don’t get caught paying top dollar. Fill up in advance so you can get the same amount of gas for less money. Do you plan on traveling for spring break or summer vacation? How will you keep your fuel and other travel expenses low?